Taylor Ewert remembers watching a thrilling mile race between elite high school girls a year ago at the Armory. By then, the then-sophomore from Beavercreek (OH) High School had just completed her second experience at the Millrose Games, having set an American junior record in the one-mile race walk in 6:45.68 while finishing third in a field that included internationals. But even then, she knew she had the potential to be in that other race. "Knowing how amazing that mile race is and what a great opportunity it is," she said. A year later, Ewert has certainly proved her credentials. This week it was officially announced that she will be a participant in both the women's 1-mile race walk and the elite high school mile field at the 112th Millrose Games on Feb. 9 in New York. No high school girl has ever ran in both during the event's history. "I'm really excited to get out in a really good mile," said Ewert, who was recently announced as Ohio's Gatorade Cross Country Athlete of the Year this past fall. "I've never had to race an all out mile, but it will be interesting." Ewert's body of work brought her to this point. This past fall the junior broke 17 minutes in the 5K, won her first Division I state title in Ohio and became an All-American in at the 5K at both Nike Cross Nationals and Foot Locker Nationals, finishing third and fourth, respectively. But even a year ago, she showed promise on the track, too. She produced a time of 4:57.63 in the 1600m last spring, though it was part of a larger competition that included hard efforts at the 800m and 3200m. That season saw open times of 2:15.44 in the 800m and 10:35.16 in the 3200m, though it was her national championship in the 2K steeplechase of 6:38.79 which begun to show her elite talent. Fast forward to this indoor season, Ewert has already begun to tally massive efforts. 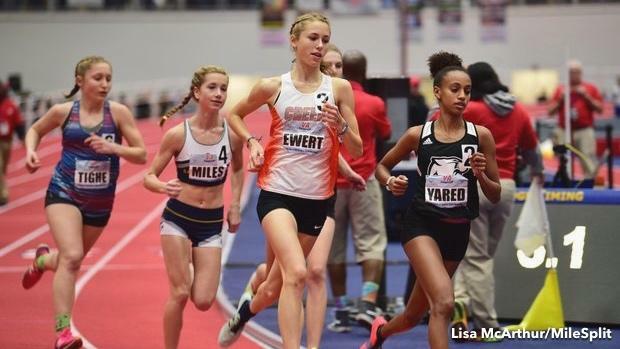 After racing to a new American Junior Record of 13:24.76 in the 3K race walk during the VA Showcase, Ewert followed with a US No. 4 time of 10:40.38 in the 2-mile race the very next day. "I think my approach going into the mile race is that I will definitely watch a couple races from the last few years to see how others raced it and to see how I should approach it," she said. Ewert says her hopes are twofold at Millrose: To lower her current national record in the 1-mile race walk and aim for a time under 6:45 against a field of internationals, while also sticking with the leaders in the 1-mile high school girls race, which will include Katelyn Tuohy, Kelsey Chmiel, Marlee Starliper, Claire Walters and Taryn Parks. "The mile race walk gets really tough, because it comes down to being really efficient with form," Ewert said. "You can only go so fast, but sub-6:45 is the goal." Meanwhile, in the elite mile, Ewert historically has tried to run near the front. "I want to make sure I don't go out too fast," she said. "And from there, just try to finish strong. When it comes down to the last two laps, I'm just going to see how I'm feeling and I'll try to nail a good time for indoors."